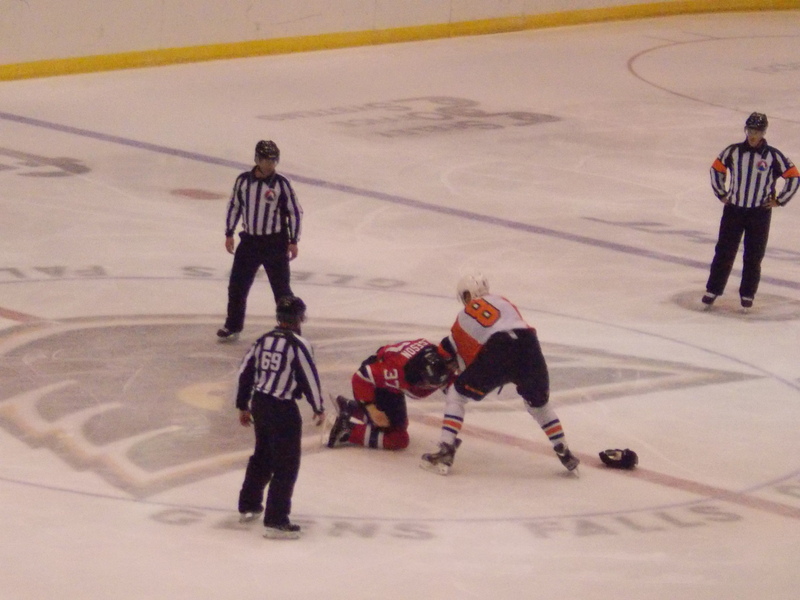 Seth Helgeson’s ill-fated fight at center ice. Welcome to the first weekly recap of the season! A brief preseason schedule for the Devils, outside of one “secret” game at The Rock against the Flyers/Phantoms two weeks ago. Two road matchups against two teams they will be seeing a lot of (and it doesn’t hurt that it’s Rangers/Flyers teams either). And if the last two days are any indication, we may be in for a fun season this year. But on that note, it’s still just preseason. The Devils started the preseason in pretty good fashion with a road win over the team formerly known as the Connecticut Whale. Scott Wedgewood drew the start and didn’t have much work to do, making 12 saves. They found themselves in an early 1-0 hole on a Tyler Gjurich goal in the first. After that, it became all Devils in the second, as they outshot the hosts by an astonishing 17-0 rate. Reid Boucher would tie the game up at 1 just as the second got underway. Just as the second was coming to an end, Darcy Zajac and newcomer Reece Scarlett scored just 1:04 apart for a 3-1 lead. Hartford would come back in the third with a pair of power play goals to tie things at 3. After an uneventful overtime, it was on to the shootout, an area that killed the Devils in 2012-13. Boucher and camp tryout Artem Demkov scored in the first two rounds, while Wedgewood stopped 2 of 4. In the fifth round, Hartford was kept off the scoreboard, but the other camp tryout, Dmitri Goldenkov, would score the game winner and give Albany the victory. Demkov, Joe Whitney, and Seth Helgeson each had an assist. In what has become an almost annual start to the year, the Devils traveled north to Glens Falls for the preseason finale against the Phantoms. Also, it was my first chance to get a look at what I’ll be seeing on the ice for most of this season. Harri Pesonen gave the Devils the first period lead, only to see Adirondack tie it up 2 minutes later on the first power play of the night. Newcomer Ben Thomson broke the tie 6 minutes into the second (even though from my angle it appeared Eric Gelinas had the goal all the way; he was given the primary assist). Then the penalty party started up…first the lone bout of the night, Seth Helgeson taking on (and not faring very well; someone missed Cam’s fighting seminar!) Doug Clarkson. Yes, David’s younger brother. And for those asking, I did not see the patented #ClarksonFall. Then referee Graham Skilliter started handing out Albany power plays like candy…5 minors were called on the Phantoms in the last 9:55 of the period, including some extended 5 on 3 time. It took till the last penalty on the board for the Devils to connect, as Pesonen scored his second of the game just 38 seconds into the 3rd for a 3-1 Devil lead. 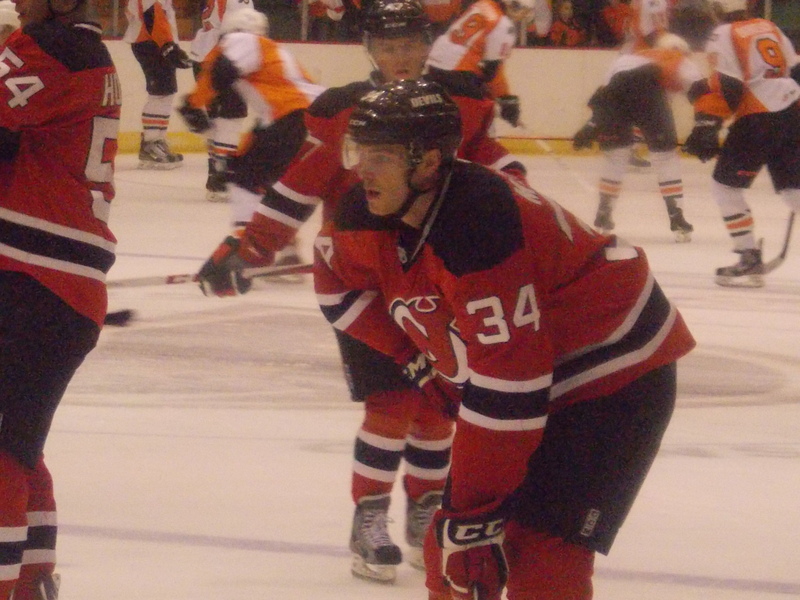 Jason Akeson would draw the Phantoms to within one goal 6 minutes later. Despite a late charge from Adirondack that included a penalty kill, the Devils held on for the win and capped off a brief perfect preseason tuneup. Maxime Clermont drew the start and played very well, stopping 29 of 31 shots. Brandon Burlon contributed two assists. Yesterday morning, there was reason among the Devils contingent to celebrate, as Krys Barch and a 2015 7th round draft pick were dealt to Florida for forward Scott Timmins and a 2014 6th round pick. Timmins has already cleared waivers with Florida, so it is most likely he will be joining Albany at some point this week. He spent last season with San Antonio, putting up 24 points (11 goals, 13 assists) in 65 games. He also played with Adam Henrique, Andrei Loktionov, and Harry Young on the 2010 Memorial Cup-winning Windsor Spitfires. But, he’s probably most famous for something that happened off ice last season. 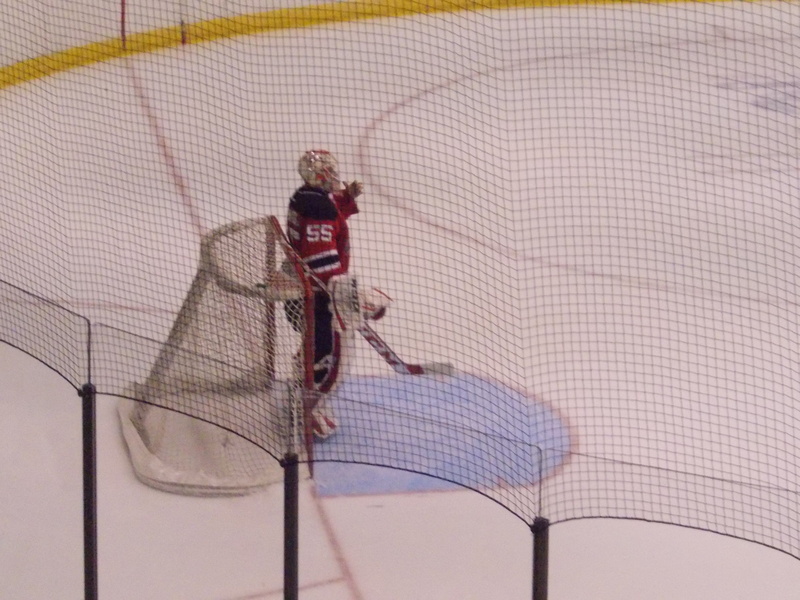 And per a tweet from Fire and Ice, Keith Kinkaid has been reassigned to Albany. 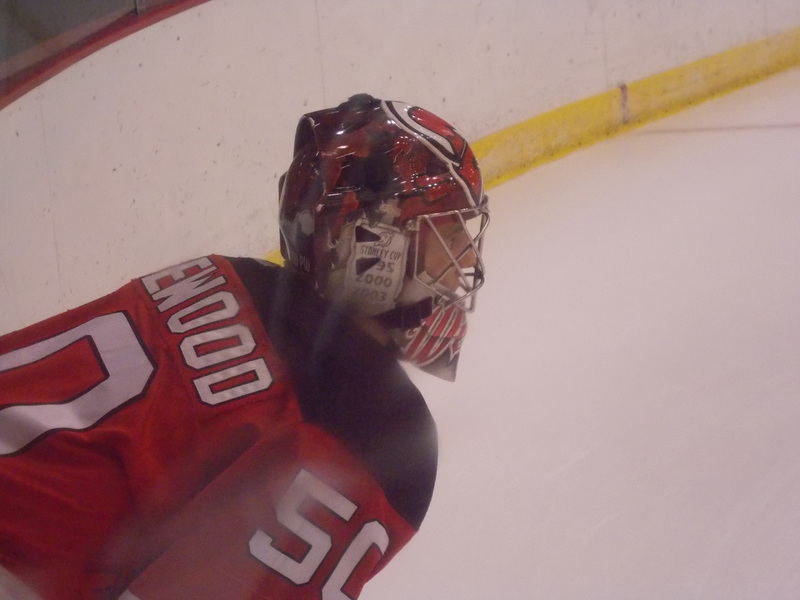 He had stayed on the roster after Martin Brodeur returned home after the passing of his father Denis on Thursday. Monday is the deadline for New Jersey to get the roster down to 23, and as of now there are three players left. Albany too has a few decisions to make to get their roster set for the start of the AHL season. Next Sunday, things get started for real in Hartford. I’m expecting all will join the other group already in camp in time for tomorrow’s preseason opener in Hartford against the Wolfpack. Pelley and Matteau are the only “new faces” so to speak of this group–Pelley is rejoining the organization after 2 seasons away, while Matteau…well, the 2012 first rounder has had quite the interesting last year or so, shall we say? A little surprising to see Gelinas among the second round of cuts, he appeared in 3 of 5 games and registered a goal against the Rangers in the first game. But it also came down to his contract status–he was eligible to be sent down without having to clear waivers. The rest were all expected, with Keith Kinkaid sticking around as a third goalie in New Jersey for a few more days. There are still 5 more players to be dealt with, but many of those still standing (Alexander Urbom, Jacob Josefson, Mattias Tedenby, Cam Janssen to name a few) would have to clear waivers before they can be sent down. Come Monday it will be interesting to see the final roster decisions made and how it would affect things down here. Camp in Albany is officially underway! -Harry Young, Rod Pelley, and Tim Sestito all cleared waivers on Saturday, but only Young was assigned to Albany. Sestito actually appeared in Saturday’s 3-0 New Jersey win over the Islanders in Brooklyn, on a line with Ryan Carter (later Stefan Matteau) and Cam Janssen. Both he and Pelley are expected to be assigned to Albany shortly. -Along with the 15 sent down by New Jersey on Friday, there are four addtional skaters in camp, all forwards: Kelly Zajac, Alexandre Carrier, Artem Demkov, and Dmitri Goldenkov. Kelly, the third Zajac brother, returns for a second season after splitting time between Albany and Trenton last year. Carrier spent all of last season in Trenton, appearing in 47 games and posting 6 points (and 102 penalty minutes). Demkov is a Belarus native who split last season between Elmira (23 goals in 39 games) and Germany (1 assist in 12 games with Hamburg). Goldenkov played 8 games with Moscow Dynamo of the KHL last season, posting 1 assist. Just as I had figured, after the second game of the preseason (a 5-3 Devil loss against the Islanders), New Jersey announced this morning their first round of training camp cuts. There were a couple of surprises as to who was sent to Albany and who is still with the big club. A total of 21 players, 15 to Albany, have been sent packing. Anthony Brodeur, Myles Bell, Graham Black, Remy Giftopoulos, Ben Johnson, and Ryan Kujawinski have all been returned to their respective junior teams. Scarlett, a 20-year-old defenseman, is a 2011 draft selection who spent the last four seasons with Swift Current of the WHL. Boychuk, a 22-year-old forward, was the player acquired from the Sabres in the Henrik Tallinder trade back in July. He spent last season with Fort Worth of the Central Hockey League. Thomson, a 20-year-old forward, is a 2012 draft pick who played the last four seasons in Kitchener (OHL). Pesonen, Zajac, and Boucher had a chance to suit up for New Jersey on Monday, with Boucher also appearing in Thursday’s loss to the Islanders. As for who’s still with the big club? Not surprised to still see Eric Gelinas up, especially after his performance in the first two preseason games (scoring Monday and assisting on both goals last night). Brandon Burlon, Mike Sislo, Tim Sestito, Jon Merrill, and Damon Severson are just a few who are also still in New Jersey. Same with Harry Young (I’m scratching my head on that one). The Albany group is scheduled to have their first practice tomorrow afternoon. They actually had a “secret” game against the Phantoms on Thursday at the Prudential Center, with the Flyers prospects coming away with a 4-2 win. Fire and Ice and The Post Star have the recaps. New Jersey has four preseason games left, starting tomorrow night in Brooklyn against the Islanders. Then it’s back to back road games on Monday and Tuesday in Montreal and Philadelphia. My guess is more cuts would come by Wednesday at the latest, with Albany’s short preseason schedule starting up on Thursday night in Hartford. 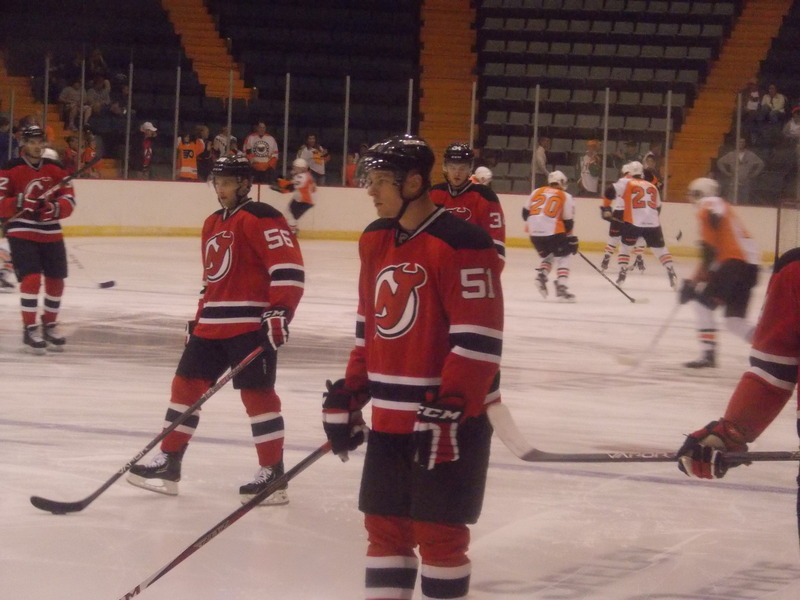 -Earlier today New Jersey announced that former River Rat/Devil Sergei Brylin will be joining the Albany coaching staff as an assistant under Rick Kowalsky. He spent quite a few games with Albany (both home and on the road) last season while working for New Jersey as a special assignment coach. “Sarge” also brings quite a resume to the table…helping win the Rats’ lone Calder Cup in the 1994-95 season, winning 3 Stanley Cups with New Jersey, and spending his entire 13 year NHL career in the Devils red and white (he spent 4 years in the KHL post Devils). -Also today, the American Hockey League officially announced its plans for the 2014 AHL All Star Classic. St. John’s was named as the host (something that was well known for a couple months) for the two day event. This year, it’s quite a different concept: instead of Eastern Conference vs. Western Conference, one team representing the league will be taking on an European team, Farjestad BK out of the Swedish Hockey League. And instead of taking place the last week of January, it will be held on February 11th and 12th, during the NHL Olympic Break. I’m curious as to how the All Star team will be formed, with 30 teams to pick from…one player representing each team? Or will some teams end up being left out? As for Farjestad…looking at their roster, there are quite a few familiar names from past AHL/ECHL teams, including former River Rat Christian Berglund (remember him?). -And finally, individual tickets go on sale Saturday morning! That time of year has finally arrived. A numerical list can be found here. -Looks like Corbin McPherson and Chris McKelvie are back in the fold for this season. I’m going to assume they were given AHL contracts, even though nothing official has been released. That puts the number of players from last year’s team still without a home down to 4. -There is one unfamiliar name on the list, and it’s probably one of the more awesome hockey names I’ve seen: Remy Giftopoulos. He split last season between Ottawa and Windsor in the OHL, where in 71 games he put up 25 goals and 23 assists. He is expected to return to Windsor, only in camp to be evaluated by the Devils brass. From Fire & Ice: an interview with Mattias Tedenby and Rod Pelley. From The Star Ledger: more Pelley and an appearance from Cam Janssen.